The Consuming Nature workshop exposed participants to the multitude of endlessly fascinating local resources of visual and material culture for learning about the presence of human influence across Pittsburgh landscapes. These resources have transformed not only my research, from which I now draw upon dozens of primary sources discovered through my participation in this workshop, but have radically transformed my teaching as well. Over the past year, consideration for place and environment has become significantly influential to my pedagogy of teaching and learning, and I have incorporated making use of these resources into my class instruction and assignments a primary objective. On a typically cold and rainy Pittsburgh day in February, my two Argument classes were asked to visit and explore the Carnegie Museum of Art and Museum of Natural History, and select an artifact or exhibit for their critical consideration in an upcoming paper. They were given as much time as needed to wander through the expansive museum spaces and consider what artifacts drew their attention. In selecting the object(s) of their case study, students were asked to reflect on various questions: What are museums? What purpose do they serve? How and what do their exhibits communicate? Museum spaces shape public frames of the subject matter they collect and include in display, just as they shape public perception of what is excluded from their space. 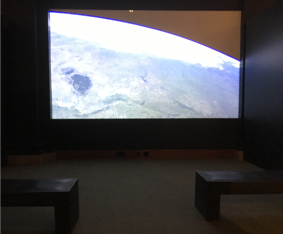 The most discussed exhibit was the Carnegie Museum of Natural History’s We are Nature: Living in the Anthropocene. The introduction to the exhibit identifies that “our collections and research tell various stories of the human impact” on the environment, revealing “hard truths, inspiration, and human ingenuity in the face of the Anthropocene.” Students identified various themes present in communicating what the Anthropocene is and why it matters. Gabby Mineroff, a sophomore Media and Professional Communication major, considers the work museums put into targeting visitors who are children. Gabby ultimately argues that “when a child engages in a creative space they are passively parking in the ideology of the museum. For the Carnegie Museum’s Future Thinking Lab, the ideology of saving the environment is transmitted to the children when they partake in the activity.” The various publics that the museum seeks to reach in their exhibition of We are Nature were revealed to be diverse and varied. Another student examines the exhibit through the lens of ecofeminism and ecomaternalism, in order to demonstrate how the use of masculine colors and design features might encourage men to take action against environmental degradation.